The company is focused on developing LL-37 for healing of venous leg ulcers, but also sees a strong potential to develop LL-37 for use in the treatment of diabetic foot ulcers. Promore Pharma estimates that the probabilities are strong to obtain market authorization for LL-37 in the treatment of small- and mid-sized venous leg ulcers based on data from a future Phase III program. The drug candidate is applied as a gel, locally on the wound, two to three times per week by a nurse or in some cases by the patient. LL-37 is developed to be used in conjunction with regular dressing changes of the wound. Consequently, it is not necessary to change the principal medical practice in the wound management. LL-37 is part of a human antimicrobial protein (human cathelicidin) which is an important constituent in the natural wound healing process. In acute wounds, LL-37 is present in the wound edge, and the amount of the peptide is typically increased within a few hours after an injury (1). In contrast, in venous leg ulcers, the expression of LL-37 is absent in the wound edge. LL-37 impacts several biological mechanisms of relevance in wound healing. The peptide attracts inflammatory cells, including monocytes and granulocytes. It is postulated that LL-37 modulates the inflammatory phase of wound healing through release of proteins and peptides that govern the inflammatory sequence (cytokines) (2). Keratinocytes (skin epithelial cells) are activated by LL-37, which in turn results in activation of growth factors in outer skin layer with a consequent cell migration. This is assumed to result in re-epithelization and closure of the wound (3). Additionally, the production of vascular growth factors such as VEGF and the activation of endothelial cells in blood vessels are also important for the formation of new blood vessels that is observed after treatment with LL-37 (4). 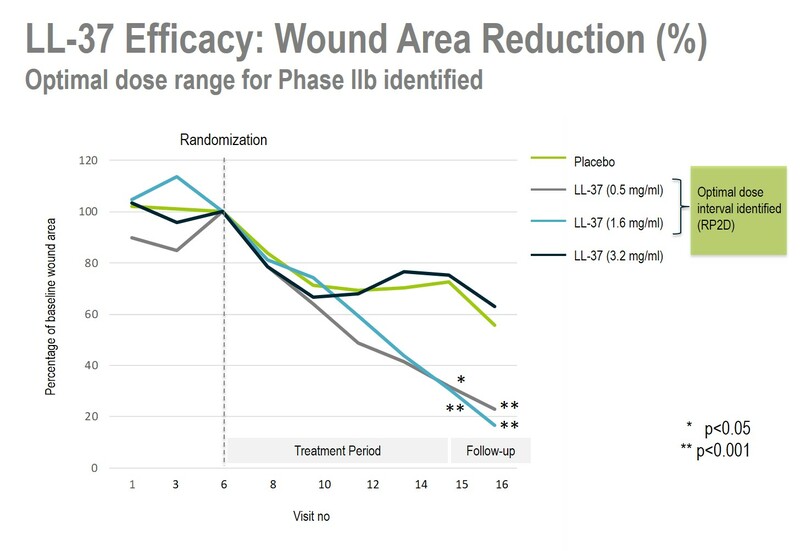 LL-37 has been explored in a Phase IIa clinical trial (also referred to as a Phase I/IIa trial) including 34 patients with venous leg ulcers; a study where safety and tolerability were the primary endpoint. (5) The patients were randomized in four different groups; three dose strengths of LL-37 and placebo. The trial also included secondary endpoints such a wound area size estimations and wound healing rate. The two lower doses of LL-37 demonstrated high tolerability and were associated with a pronounced healing; the healing rate being almost six-fold higher than for the placebo group. Treatment for one month with the most efficacious dose resulted in a relative wound area reduction of 75 percent. In contrast, the highest dose was associated with local reactions (redness, pain and effusion). The highest dose did not produce a wound healing effect as compared with the placebo group, but was not worse than placebo. These findings are important, since it indicates that the company has succeeded in identifying the efficacious dose interval. The company has initiated a Phase IIb trial (HEAL) of LL-37 in Sweden and Poland. The study is aimed at including approximately 120 patients with venous leg ulcers that will be randomized into three groups (two doses of LL-37 and placebo) and have a treatment time of 13 weeks. The primary endpoint is the proportion of patients that reach complete wound closure, which is considered to be the pivotal endpoint for market authorization (later to be tested in a Phase III program). There is scientific evidence suggesting that LL-37 also may be efficacious in diabetic foot ulcers. Diabetic foot ulcers, just as venous leg ulcers, lack LL-37 in the wound edge (6). The company therefore assumes that diabetic foot ulcers may present an opportunity for indication broadening. A clinical trial to explore the preliminary efficacy of LL-37 in the treatment of diabetic foot ulcers can probably be accomplished as a small well-controlled Phase IIa study. The company is assuming that the dose range defined in the Phase IIb trial completed in venous leg ulcers can be used to reduce the number of arms of active drug administered, in order to minimize the number of patients required to reach statistically relevant data.